Sign up NOW for your FREE JBF account. You can choose to sell items & also register to help out at the sale to shop even earlier & earn up to an extra 10% on your items sold! * We’ve got helpful videos too! * If you want to donate anything that doesn’t sell, you’re done! If you want to pick up unsold items, see times for that, too. ...& within 14 days later, your check is direct deposited! • Consignors earn 60% less $15 processing fee per sale event (deducted from your check at the end of the sale). Pay your Consignor fee early through our EventBrite link to only pay $10 instead of $15! Early Bird sign up ends 9/30. Click Here. • Consignors who are able to help during (or before) the sale earn more on their items sold (4 hours=65%, 8 hours 70%). • Our tagging site is open year-round, so get a jump start on your tagging. You can even use your Smart Phone with Talk to Text! • We are accepting ALL SEASON (Spring, Summer, Fall, Winter) items. After all this is California where you can drive to the snow and be at the beach in the same day! • Too busy to tag? Try our Valet Tagging (scroll down for more information below)! • NEW - Refer a Friend to Consign & Have $5 Added to Your Check! No Limit! Both parties must consign at least 50 items & the new friend being referred must not have consigned with JBF before. Send the name of the person you are referring to Charmaine at charmainegobo@jbfsale.com. As a Volunteer Team Member it gives you an opportunity to make more on top of your 60%. Help out for 4 hours and get 65%, 8 hours or more and get 70%. PLUS the more you volunteer, the earlier you shop on Pre-Sale Day (before the public)! If you can't join our team yourself, we'll happily welcome your husband, brother or father - in fact, we could really use the MUSCLE! We open up Team Member schedule closer to the event. Our Facebook fans found out first when it was time to sign up, so be sure to "LIKE" us on our Facebook page so you can be first too! Please Note: For the safety of all, children are not allowed during your shift times. You must be a Consignor at the event (selling a minimum of 20 items) in order to become a Team Member and help at the sale. Team Members are expected to complete any shift or barter that they sign up for! If your shift is cancelled online or not completed after you shop the presale you will be penalized. We depend on all volunteer shifts! Please please take this responsibility seriously! Please remember that you need to be comfortable. We recommend wearing close-toed shoes that give you lots of support. And please wear clothing that lets you move easily. Please arrive 15 minutes before your shift starts and we will train you on all you need to know! See you there! Then select "Volunteer" box & another window will pop up displaying all the different shifts available. **If for some reason you do not see the "Volunteer" box it is because we have not opened up sign ups. So be sure to check back! Are you wondering what types of shifts there are? Below are a few examples. Event Set Up / Break Down (also great shift to volunteer your husband or father). If you can't help out during the sale we also need help before the sale. 2nd Drop Off: Friday Nov 3 @ 7:00pm-8:00pm Find more items to consign? You can bring them to this mid-sale drop off and still make the sale! We accept everything EXCEPT clothing for this drop off date. Examples: toys, books, shoes, outdoor play equipment, ride on toys, & more. **Prepare for 15 minutes to 1hr to drop off depending on how many items you have. Bring your signed Consignor Agreement (link), Car Seat Checklist (link), and Crib Waiver (link) (if applicable). When you arrive, bring one small item with barcode so we can scan to check. Register at the Consignor Registration Table at the entrance to the building. Still time to Volunteer and earn 5%-10% on sold items. If already signed up verify your Team Member Schedule and add shifts to increase your sales profits (if desired). Pick up passes for pre-sale. Place your items in designated areas, display toys on tables, and set up large items (cribs, play pens, furniture items). Every consignor starts off on the perfect consignor list. If we have to remove 5 or more items from the sale floor during the sale, you will have to go through an inspection process that next sale. If we do not pull 5 or more items, you will remain on the perfect consignor list and have no inspection! Car Seat, Car Seat Base, & Booster must be inspected. Bring a copy of the Car Seat Waiver form along with copy of manual. Rolling racks are available at the sale to assist you in transporting your clothing items. You may want to bring a wagon or other rolling device to assist in loading in your toy items. 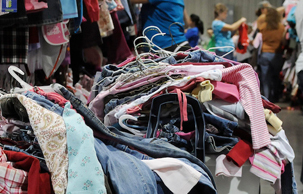 Drop off time will be quicker if you have your clothing items separated by size and gender (rubber-banding sizes together will help prevent them from separating when transporting your clothes to the sale). Large items that need assembly always sell better when assembled, so be sure to plan enough time to do that and bring whatever tools you will need. Shoppers are wary of unassembled items. After the sale, your clothing and other items will be sorted and ready for you to pick-up at the scheduled consignor pick-up time. If we finish sorting early we will post to Facebook and send out an email. At 7:31pm remaining items are donated to ARC charity. Sorry, no exceptions as we need to vacate the building. Look over lost and found and recalled table. Initial your paper and turn in at front desk. Pick up takes approximately 5 minutes to 15 minutes depending upon how many items you have to pick up as we pre-sort all your items so you do not have to search for them all over the floor. Don't skip any of the Pick Up Steps or you may miss taking home some of your items. All items left get donated. When looking at the items on the tables, please look under the table and all around it. If you have missing items, please wait until you receive your check to inquire about them. Many of your missing item questions are answered once you receive your check. Don't be late! Pick Up ends at 7:30pm and we are very serious about that being our cut-off time. We have to prepare all of the remaining items to be loaded onto the the trucks for our charity partners and this begins at 7:31pm. Bring something to haul your things home in. We will use the majority of our rolling racks in our Security/Check Out area and they will not be available for you to borrow. You will have to provide your own manpower for collecting your items and getting them to your car. Even though all of your items have been sorted and checked once or twice for proper sorting, we ask that you please make sure all of your items really are yours. Our volunteers do a great job of sorting but we all know that tired eyes can transpose numbers, so please double-check before you head to Security to check out. If you are picking up for more than one person, keeping the items separate will make going through Security much easier. Gather: Exersaucers, swings, high chairs, changing tables, strollers, bath seats, baby walkers. We also accept toddler and youth twin beds, dressers and youth desks. Inspect carefully to ensure items have all pieces and are not recalled, stained, or damaged. If you are selling a crib, fill out Crib Waiver to ensure it meets the requirements to save you the time from transporting to the sale. Package: Items should be assembled at the event to ensure that all of the parts are present and functioning. Tag: Attach tag to item with a safety pin or clear packing tape. Do not use tape on fabric or delicate items. You can punch a hole in the top of the tag and secure the tag with ribbon or zip ties. Place a piece of tape on tag before punching a hole. This will reinforce the tag so that it is not torn off your item. Gather: Diaper bags, infant carriers, backpacks, lunch boxes and kid's purses are great consignment items. We are unable to accept women's handbags unless its a diaper bag. Gather: Bassinet, crib, toddler, and twin bedding with KID patterns. NO King/queen bedding. Please be selective when selling bedding, blankets, receiving blankets, burp cloths, and towels. New and barely used items sell best. Check carefully for stains. We recommend selling matching lamps and room decor separately. Package: Put bedding/crib sets together in original packaging or in giant CLEAR plastic bags. Arrange bedding set inside bag so that shoppers can see all of the items. Secure the bag so that items do not get separated. Safety pin or zip tie multiple pieces together to ensure they are not separated. Include a picture if possible next to tag so Shopper can visualize what it looks like. Tag: If bedding is in a plastic bag, attach tag securely with packaging tape to the inside of the bag where it can be seen. Tape the bag shut. Attach tag to fabric items with a safety pin. Do not use tape on fabric or delicate items. You can punch a hole in the top of the tag and secure the tag with ribbon or zip ties. Place a piece of tape on tag before punching a hole. This will reinforce the tag so that it is not torn off your item. Gather: Books, book sets, board games, puzzles, video games, video game systems, scrapbook, arts & crafts sets are great items for resale. Please only bring kids’, parenting, homeschooling, pregnancy and child rearing books. Games and puzzles must have all pieces. (No "adult" content please or "M" video games.) We are unable to accept VHS tapes. Check items to ensure they are in great condition - please, no scratches or missing DVDs. Tag: When tagging books, please attach your tag to the book with clear tape or blue painter's tape that can be removed without damaging the item. Tape tag to the outside cover of glossy books and to the inside cover of books that will easily tear when removing the tag. Please do not use masking or double sided tape. 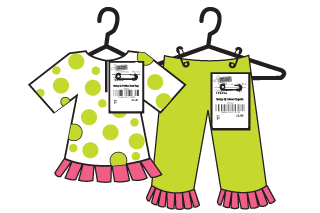 Hole-punch JBF tag and tie to sets. Gather: Car seats and Car Booster Seats that are less than 5 years old. Check our Safety & Recalls link below for more information. Package: A fully completed waiver is required for all car/booster seats. Waiver can be printed from HERE. Attach the waiver to your car seat. Tag: Attach tag to item with a safety pin, zip-tie, or clear packing tape. Do not use tape on fabric or delicate items. You can punch a hole in the top of the tag and secure the tag with ribbon or zip ties. Place a piece of tape on tag before punching a hole. This will reinforce the tag so that it is not torn off your item. Gather: Children's clothing Newborn through size 20. Maternity all sizes. Be picky. No stained or damaged items will be accepted. Please freshly clean your clothing - ironing attracts more buyers too. Replace missing buttons, sew loose hems and seams, and clip loose threads. Button all buttons, snap all snaps, zip all zippers before you arrive at drop off. Clothing should be new styles purchased within the last 5 years. Package: Multi piece clothing items must be safety pinned together through ALL pieces (don't use a tag gun for this). If selling item with an accessory such as a hat/pair of socks, safety pin accessory securely to clothing item. We DO NOT have a minimum price rule. We encourage you to price your items competitively and use our pricing guide as a resource. In general price 50% - 90% off retail. Tag Location: Attach tag with a tag gun to the size label in top area or safety pin to the upper right side. Insert the gun in a size label or inside seam in neck area. Do NOT use tag guns through part of the clothing as this will making a hole and permanently damage your clothing. PULL on the tag to make sure it is properly secured and will not fall off. You may also safety pin tag to the upper right side of garment, as you are looking at the item. DO NOT place tag in arm pit seam or through shirt sleeve seam or bottom of garment, as this makes it difficult for us to scan and sort. See link above for helpful pictures of tag gun do's and don'ts. Make sure tags are visible - not tucked inside clothing. Sort: all clothing by size and gender for an easier drop off. Rubberband sizes together when transporting. Note: Sets sell well in smaller sizes. IMPORTANT: Make sure that the sizes are the same (double check!!) and it is best to match the same brand too. Note: As kids reach the pre-teen sizes (10-16), they are very particular. Clothing must be in excellent condition and very CURRENT style. Gather: Nursing covers & pillows, feeding items, monitors, safety items, diapering & toileting items, rattles, and more. Gather: Household furniture items (no knick knacks please). Gather: Make sure that shoes are clean, clean, clean! We will be VERY selective with shoes during Consignor Drop Off & Inspection. Gather: Ride-on toys, block sets, dolls, remote control cars, outdoor toys, learning toys, and more sell like HOT CAKES. All toys must be checked for safety recalls before consigning. Clean all toys and baby equipment thoroughly. Please test to make sure that toys and equipment are working properly. Battery operated toys must include working batteries (these can be purchased inexpensively at local dollar stores). Package: Small items may be tagged separately or grouped together in zip-loc bags. Note: REMEMBER, DO NOT use tape to attach tag to an item that is made of cotton-like material (like a blanket or hat) the tag will fall off! We’ve got you covered! Valet tagging is available to a limited number of Consignors each sale so be sure to sign up early. All items must be dropped off by Oct 21st. 4. We tag them for you by pricing, hanging, pinning items. You can then pick up the items when ready or have us deliver them for you to the sale. 5. At the end of the sale, if you chose not to donate items you can pick them up. Or have us mark them as donate and get a tax write off form. 6. Tagging fee is $0.45 per tagged item. This includes cardstock, hangers, pins, labor, etc. After the first 150 items there is a $5 supply fee for every additional 100 items (i.e. 151-250, 351-350, etc) You will then earn 60% of items sold minus $15 consignor fee deducted from your check at the end. You can earn 65% for 4 hours or 70% for 8 hours of helping out at the sale. Pay your Consignor fee early through our EventBrite link to only pay $7.50 instead of $15! Early Bird sign up ends 9/15. Click Here. Stock up on these supplies early! 8 weeks before the next sale is suggested as stores tend to sell out and not re-stock quickly. WHITE cardstock (any weight. Regular computer paper not accepted as it tears easily). ** We also will do a few supply pick ups closer to the sale where we buy supplies in bulk to then pass the savings onto you! Be sure to follow us on Facebook where we make the announcements. Turn JBF into a fundraiser for your school, troop or moms group. Gather donated items from students, friends and/or other families, set up a donation bin at your school, OR go shopping at garage sales and thrift stores. Register and tag under ONE consignor number and get check 2 weeks after each event! It's that EASY!